Image via Lynne's (of the delightful Sugar City Journal) flickr. Thanks, Joslyn! So nice of you. 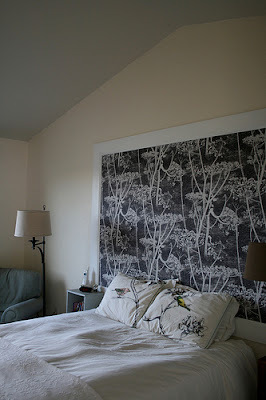 This was a really easy project, requiring little wallpaper (just half a roll) and little DIY-involving-saws skill, so perfect for my husband and me. It's wallpaper framed out with molding... (the cow parsely Cole & Sons wallpaper purchased on the cheap from www.discountdecorators.com). I love your blog, and am also going to try and go purchase free. One of these months. Not this one. Yes, Lynne has certainly worked magic on her bedroom. Isn't it dreamy? it's really incredible! thanks Lynne for the info...i'm fully planning to "borrow" this idea for a blank spot in our house.